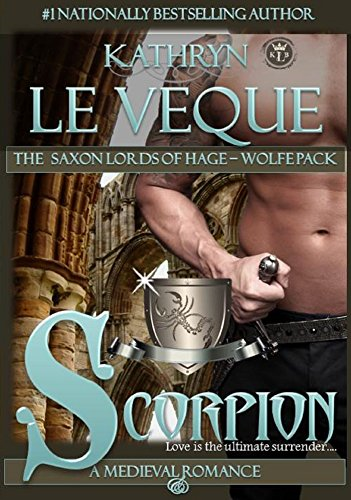 If you haven’t heard, it’s release day for Kathryn Le Veque’s most recent medieval romance, Scorpion. I’ve enjoyed all of the books she’s written, although I haven’t read nearly enough. Do you know she’s written 60 novels and she just keeps pumping them out? You’d think she’d run out of ideas. NOT. Do NOT miss getting started reading her novels. It’s like potato chips. You can’t manage reading only one of her books, you’ll always want more. Congratulations, Ms. Le Veque! 1289 A.D. – Sir Kevin Hage, stinging over the loss of the object of his affections to the Welsh warrior known as the Serpent, drowns himself in warfare in order to forget his heartache. He travels to The Levant to fight the Muslim infidels, transforming himself in the process. He becomes hardened, brutal, and heroic and returns to England a changed man, an English assassin known as the Scorpion. Now on the home front, he must fight a battle greater than himself – the fear of loving a woman under extraordinarily difficult circumstances. With all odds against them, follow Kevin and his lady on their journey of discovery, adventure, and an awakening love that is stronger than all the stars in the heavens in this unforgettable Medieval romance. Love… thy name is SCORPION. 1 Response to Today Is Release Day!! Thank You For the Re-Blog and your additional thoughts.